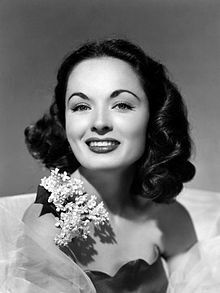 Ann Marie Blyth (born August 16, 1928) is an American actress and singer. Her performance as Veda Pierce in the 1945 movie Mildred Pierce, she was nominated for an Academy Award for Best Supporting Actress. Blyth also appeared in Our Very Own (with Farley Granger), The Great Caruso (with Mario Lanza), One Minute to Zero (with Robert Mitchum), The World in His Arms (with Gregory Peck), Rose Marie, The Student Prince, Kismet, The Buster Keaton Story, and The Helen Morgan Story (with Paul Newman). This page was last changed on 16 July 2018, at 18:31.